Hawaii Native Status: Cultivated. 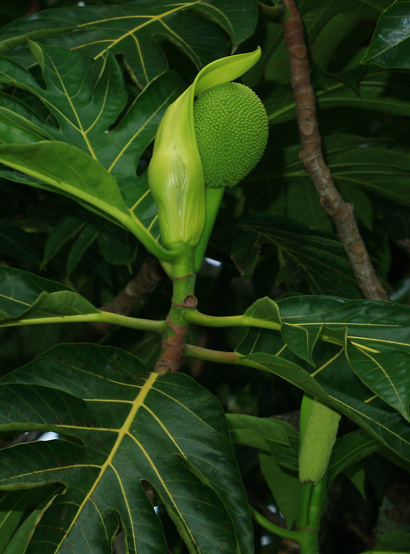 This food plant is native to Indonesia, Papua New Guinea, Micronesia, Vanuatu, and the Solomon Islands, but it is now grown in tropical areas around the World. Description: The plants are monoecious with male and female flowers on the same plant. The tiny male flowers emerge first and are on spongy, erect, cylindrical to club-shaped, up to 18 inch (45 cm) long, yellow-green inflorescences. The tiny female flowers are on prickly, ball-shaped, lime green inflorescences. The female flowers are followed by large, rounded, smooth to spiny, typically seedless, green to yellowish multiple fruits with white to pale yellow flesh. 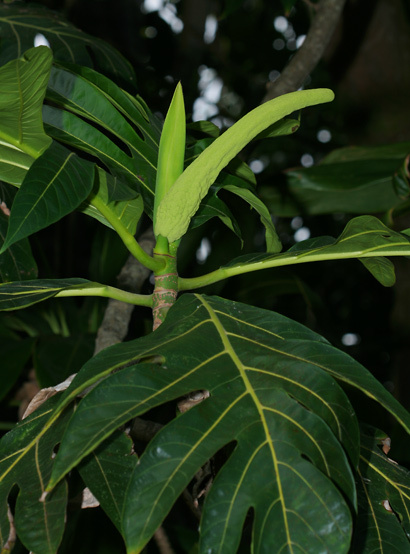 The leaves have yellow veins and are glossy dark green, leathery, alternate, up to 3 feet (91 cm) long, egg-shaped, and barely lobed to deeply pinnately lobed. The bark is smooth and gray in color. The plants contain milky latex sap, and the fruits and leaves often have dried, bird dropping-like splatters of white sap on them. 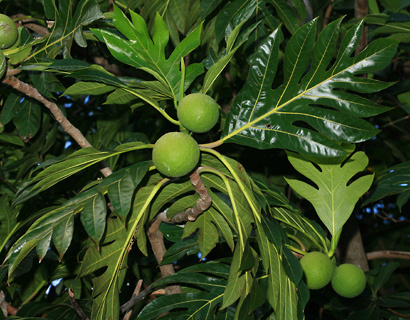 Here in Hawaii, Breadfruit grows in tropical lowland areas, especially in those areas near ancient Hawaiian settlements. These fast-growing trees are mainly propagated by root shoots and root cuttings. 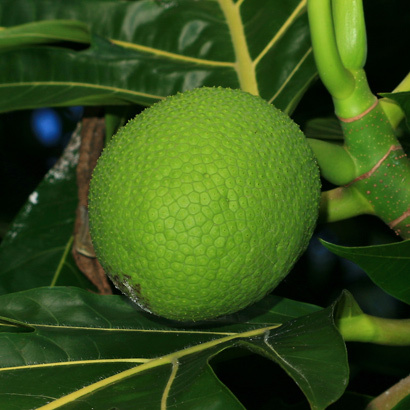 Canoe Plant – The ancient Polynesians brought Breadfruit to Hawaii in their canoes. The plants and especially the milky sap were used for medicinal purposes. The fruits were cooked and eaten and sometimes used to make poi. Edible – The white flesh of the fruits is edible if cooked and is quite delicious. Eating the raw, uncooked fruits will cause nausea and vomiting, but the cooked fruits are safe to eat. The firm, starchy, less ripe fruits can be cooked and used just like potatoes, while the softer, sweeter, fully ripe fruits can be mixed with coconut milk to make delicious pudding. The fully ripe fruits have yellowish to brownish skin.